Uitspan Hunting Ranch received this letter from Hannes Swart, an Industrial Psychologist of Cape Town. Hannes hunted with us every year for the last 4 years. He hunts for venison and do all the meat processing himself. 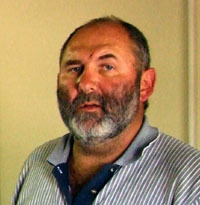 Hannes respects nature and animals and has a passion for the Kalahari. He is one of our most respected clients and a special friend. We enjoy his company and we have had great times together in the Kalahari. We feel honored and privileged for receiving a letter like this. Having just completed my fourth consecutive hunting trip to Uitspan Hunting, I deemed it appropriate to share my experience with you. Upon reflection of this fourth trip, I believe there are some definite aspects that merit consideration in making this annual experience for me a non-negotiable one as well as a most memorable one. On the outset you must be complimented in the way that you generally assist me in getting all documentation and preparation in order  what with the import of rifles, permits and the like. This might seem trivial to the uninformed, but a must to the prospective hunter to Namibia. The labyrinth of increasing bureaucratic obstacles can at times make the prospective hunter shy away from such a venture. However, your assistance every year thus far enhanced the planning that precedes any hunting expedition. I am particularly mindful of the fact that obtaining these permits generally necessitate long trips to the local veterinary office and at times even to the capital. Thank you very much for taking this strain off me. Arrivals on Uitspan Hunting have now become synonymous with coming home to Namibia. I truly experience being one of the family members in the respective homesteads and there has never been any exception to this rule. Throughout the course of the hunting week I am never treated as a client or a customer, but as a friend and without any pretences or side shows. In my view this makes you as Duvenhage family members exceptional. One will always get the lasting impression that you consider hunting on Uitspan as a lifestyle, not a means for financial gain. This whole philosophy is again reflected in the way you go about with any hunter  as had been the case during the past years with me. Hunting trips are properly scheduled to ensure that no overlapping of hunting expeditions occurs. I have never waited for any hunting team to clear the camps before I could embark on mine. Similarly, utmost care and patience prevail in the camp during the hunting and never did I get the impression that I am being hastened to hunt. If a spoor has to be cut, this is dealt with as part of the fun and not as a nuisance subsequent to a poor shot  even if the latter might have been the case. A lot of care is taken subsequent to the hunting in cleaning the carcasses and in this regard the assistance of the workers i.e. Dawid, Ninda and Frans must be complimented. They are as much part of the success of the whole operation as you as the owners and I can assure you that they as employees on the farm certainly compliment the hunting expeditions. There had never been any reason on my part to intervene in their cleaning of the carcasses as they simply go about it in a most professional way. The accommodation facilities are simply splendid and always exceptionally tidy and well prepared for each trip. The particular setting of the lapa is exceptional and each year I marvel in the beauty of the surrounds of the camp from the lookout site adjacent to the lapa. In addition to the accommodation facilities an aspect that is of particular importance to me are the butchery facilities. It is always clean and well maintained. Thank you very much in keeping this in shape for use every year. All of the above are pretty useless if you do not have the right team to manage it. I have been on many hunting trips and farms that can boast with all of the above and are in fact much more accessible in terms of distance to travel. 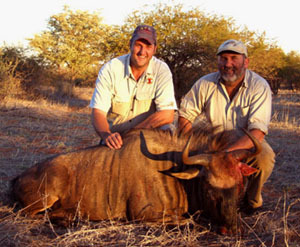 However, your personal assistance and exceptional competence in all the aspects of hunting (from beginning to end) makes the annual hunting trip to Uitspan simply incomparable with similar facilities and hence I will go through all the pains of applying for permits and traveling to Namibia every year simply to be on Uitspan. I truly experience being one of the Duvenhage family members and this is how I am being treated when I visit you. For this I can never thank you enough. My sincerest best wishes accompany you and it is my sincerest hope that I will be blessed to visit Uitspan again next year or hopefully again later this year." 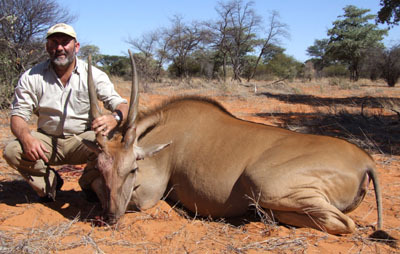 Above: Hannes with his Eland, hunted for venison. 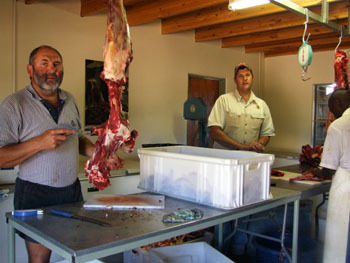 Pictures higher up: Andre (left) and Hannes with a Blue Wildebeest, also hunted for venison; the guys processing their meat.